Like the show? Buy the T-shirt! Resonance FM’s marathon fundraising extravaganza The Pay-As-You-Go Hello GoodBye Show (Part 1) was broadcast between 9.00am – 1.30pm on Saturday 13th February 2016. Performing live were The Wave Pictures, Crumhorn Connection (formerly Melody Spires), Nadine Khouri and As Ondas. Piper’s Son – Who Started This? Skinjobs – Who Wants Canaries? Emily Capell – Who Killed Smiley Culture? A massive thank you to everyone who donated towards this Resonance FM fundraiser which has so far helped raise upwards of £2,129.70. 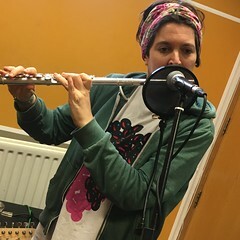 This entry was posted in dexter bentley, hello goodbye show, Hello GoodBye: Playlists, resonance fm and tagged as ondas, crumhorn connection, dexter bentley, hello goodbye show, melody spires, nadine khouri, pay as you go, resonance fm, The Wave Pictures. Bookmark the permalink.